With three fan speeds, this 400 CFM wall-mount kitchen hood provides the right ventilation for every meal you prepare and looks good while doing so. Long-lasting LED task lighting shines a bright light to show you what's cooking and a dishwasher-safe grease filter traps unwanted grease and odors, washing easily for re-use. The range hood's convertible ventilation means you can vent vapors and odors outside or filter them and recirculate the air, depending on your kitchen ventilation system setup. When venting at low speed, sound levels can get as low as 44 dBA. Is the chimney included and tall enough to reach a 9' ceiling if installed at the proper height above the range? In the installation guide for this product the maximum ceiling height is 9'5&quot; for an electric range. No mention is made of needing additional extension. Jules, please visit https://bit.ly/2DR26NR and refer to page 4 for more information on the ventilation requirements for this Whirlpool&reg; Range Hood. Hi Kenny, on this model if you need the LED light bulb changed we would recommend a service call. Is convertible kit for ductless installation included or for extra charge? 30 in. 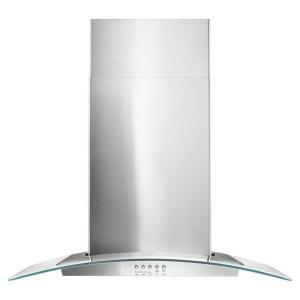 Concave Glass Wall Mount Range Hood in Stainless Steel is rated 4.4 out of 5 by 37. Rated 4 out of 5 by Katherine from Overall pleased with hood, B U T..........get rid of those... Overall pleased with hood, B U T..........get rid of those LED lights! It overwhelms my beautiful back splash and I dont live in a prison! If you can advise how I can get NORMAL lighting, AMBIENT LIGHTING instead of INDUSTRIAL LIGHTING for the hood, greatly appreciated. Also for the money I paid for this, it would have been nice to get a charcoal screen instead of a flimsy grease collector screen for the hood. Its the little things that make a WOW moment. Rated 5 out of 5 by JMcK from This looks great in the kitchen and does a great job of pulling odors, grease, and smoke from the... This looks great in the kitchen and does a great job of pulling odors, grease, and smoke from the air above the range and out of the surrounding kitchen. Easy to clean and looks professional. Highly recommend if you enjoy cooking or have to spend a good amount of time cooking. Rated 4 out of 5 by WR from I bought this unit 2 years ago... so far so good. Be aware, you will need an electrical outlet b... I bought this unit 2 years ago... so far so good. Be aware, you will need an electrical outlet behind the stainless steel enclosure. I do have 2 complaints about this unit: 1) It gets really noisy when I use higher speeds 2) The push buttons come off easy.. kind of annoying. Other than that, It is a very good looking hood. Rated 5 out of 5 by Irma from Quiet, elegant, fancy overall useful. Gave to my kitchen a... Quiet, elegant, fancy overall useful. Gave to my kitchen a touch of modern. Easy to install. Rated 5 out of 5 by BM from We had a friend help us install and it was... We had a friend help us install and it was up in no time. Very impressed! Rated 4 out of 5 by Jeff from Nice looking and quiet. About the only thing I’m... Nice looking and quiet. About the only thing I’m a little disappointed in is it only has one setting for the intensity of the light, very bright. I think at this pricepoint it should have at least 2 settings, low and high. My cheap Sanyo over the oven microwave had 3 levels of brightness!! !